Coincidence is the duct tape of fiction writing. It’s used to fix all kinds of problems in a novel, but although it kind of works, it’s not a pretty fix and readers, like the homeowner who hired a lazy plumber to fix a leak, will not like it. 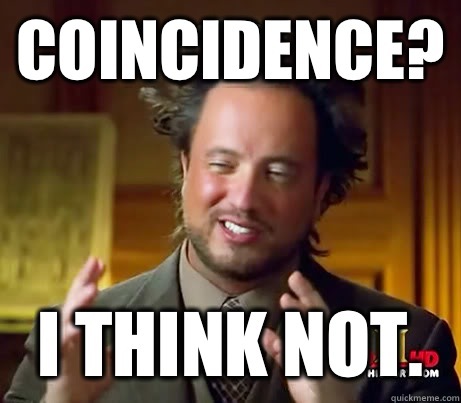 I’m not talking about coincidences that are big reveals that shake up the plot and send the hero for a loop. (“Luke, I’m your father.”) I’m talking about the ones that usually come toward the end of a book to make some plot point make sense. How is it that Mr. Dude knows ancient Sanskrit and can translate the Yoga Killer’s mysterious messages? Well, it turns out that Mr. Dude was the Yoga Killer’s Sanskrit professor back in college. Wait, what? The author introduced Mr. Dude on page 12 and she’s giving me this crucial piece of information on page 393? Twenty pages from the end? Is this perhaps because Ms. Author did not think ahead when she was planning this novel and she found that she needed someone who could translate Sanskrit and this was the best solution she could think of without going through a total rewrite? Is this being lazy? Is it a bit of a cheat? A patch she hopes will get her through to the end of the book and no one will notice? Ha! OK, I will admit I am as guilty as the next writer of trying to get away with the coincidence fix. Writing a book is a Sisyphean task. You push the rock up the mountain day after day for many days, weeks, months, even years. You ache to get to the top. Then finally you get there. You think you’re finished. It’s done. It’s perfect. Except there are one or two or three little things that need to be explained. No problem. Just patch it up with a coincidence. Don’t get into too much detail. Maybe no one will notice. Readers will forgive you and keep reading. Ha! Readers do not forgive. When I read someone else’s work, I do not forgive. Not when it comes to coincidence. This is probably why I prefer thrillers to mysteries. We’ve all probably read badly constructed mysteries where a coincidence inserted late in the book explains why the hero knows who the killer is. I cry foul. Yes, coincidences can happen in real life, but if the author can pull rabbits out of his hat, and in his fictional world anything can happen, I lose interest. I guess that’s why I don’t care much for most science fiction. If anything can happen, where’s the tension? It’s restrictions that create drama. (Vampires, sunlight, crosses, garlic, mirrors–get it?) Also, coincidences can make the protagonist passive, and there’s nothing more boring that a hero who lets things happen instead of making them happen. But you say you like complicated plots with lots of twists and turns and surprises. That’s what you want to write, you say. Fine, no probs. The solution is simple. Put that coincidence information early in the book and present it as fact, not coincidence. Mr. Dude, among other things, was a professor of Sanskrit once upon a time. Undoubtedly this will require a rewrite. Yes, another slog up the mountain with the boulder in front of you. But it will keep readers from throwing your book against the wall and giving it one star on Amazon. Otherwise it won’t be a coincidence when your publisher declines to take your next book.